I have been spending a good amount of effort in working on my brownies recipe for the last few days. After baking a couple of trays of brownies, all I can say that I am all “brownied out” for the moment ha! On that note, I have been easy on the cooking side of things, case in point the above lazy dinner which I made for dinner tonight. As I was editing the photos, I was surprised how well they turned out. Salad is such a photogenic dish, don’t you think? It makes me feel good by just looking at it! Bulk up with quinoa, couscous, lentils or chickpeas. They add substance to a salad instantly, thus you feel full after eating salad as the main meal. Everyone loves a colourful dish. Don’t be afraid to add vegetables and herbs which vary in colours and hues. For this salad, lentils on its own is rather plain. So I added speckles of green with peas and parsley. 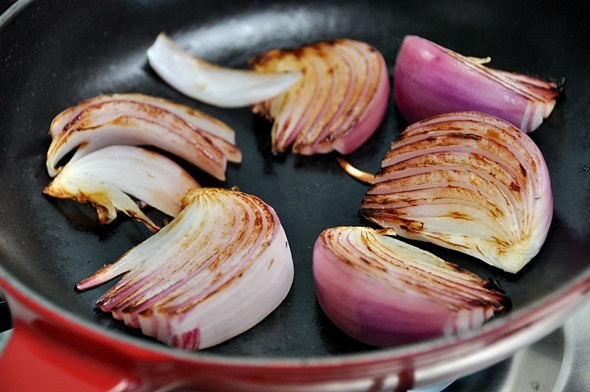 Lightly charred red onion is also an amazing addition as well as perfect for people who dislike raw onion. Make your own quick dressing if possible. Look around your pantry and fridge, you may already have the ingredients required for a spectacular dressing. I had plain yoghurt, tahini, lime and garlic on hand and they spelled delicious creamy dressing to me, no? Last but not least, texture. It will make or break a salad, I reckon. No one likes a soggy salad. Distract your palate by adding a little crunch and crisp in your salad. It could be homemade croutons i.e. dicing some stale bread, drizzle with olive oil and bake in the oven until golden brown and crunchy. Alternatively, it can be crisp vegetables like celery, carrots, capsicum or for this salad, cucumber. 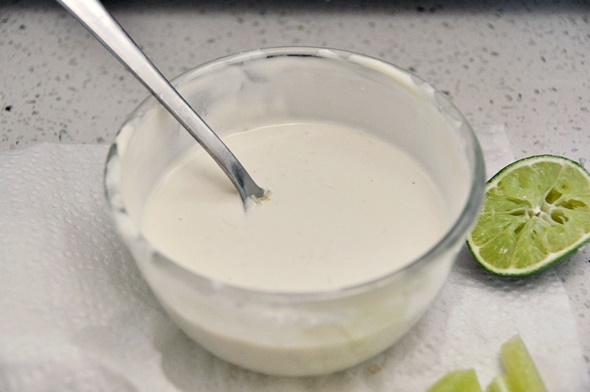 Make the dressing: In a bowl, mix tahini, yoghurt, grated garlic, lime juice, cold water and a pinch of salt until well combined. Set aside in the fridge for the flavour to develop while you prepare the salad. Please add the water gradually to achieve a consistency that you can drizzle the dressing over the salad. 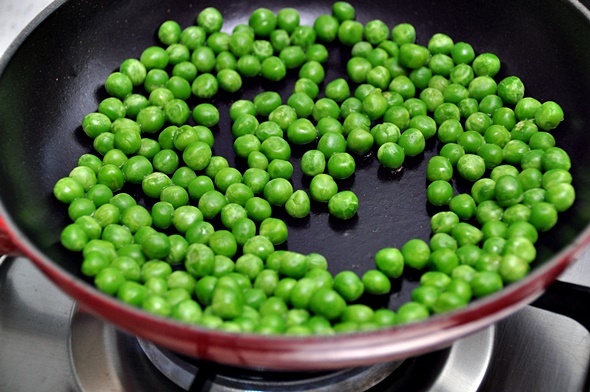 For the salad: In a small dry pan, heat through the frozen peas and set aside in a large salad (mixing) bowl. Then caramelised the onion wedges on both sides until lightly charred. Set aside on a plate. In a siever, drain the canned lentils, rinse under running cold water to remove the any residual brine and then rinse with boiling hot water. Once the lentils are drained off any excess liquid, transfer to the salad (mixing) bowl. 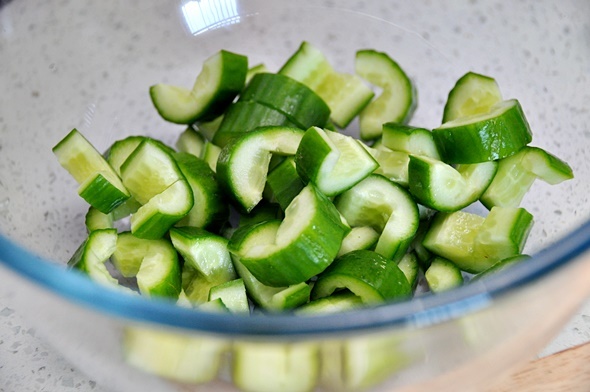 Then add sliced cucumber, and toss all the ingredients in the salad bowl with a little olive oil and the residual juice from half a lime. 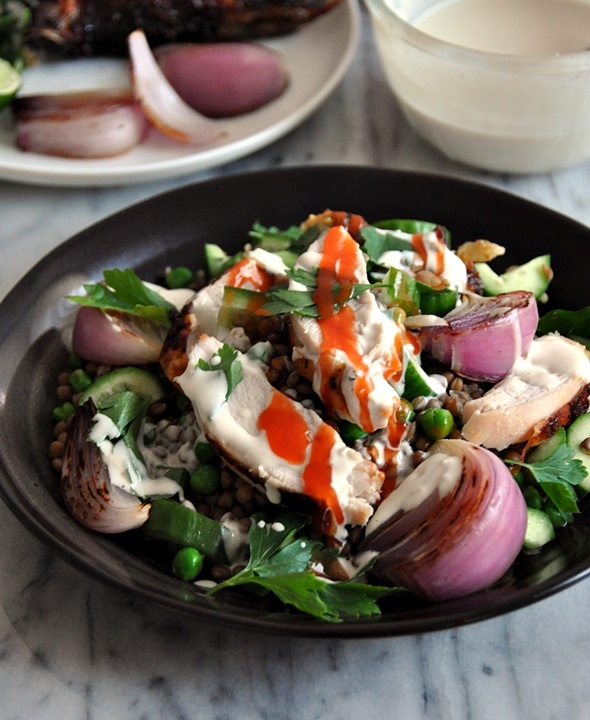 To serve: scoop the lentils-peas mixture onto a serving plate and then top with sliced chicken, scatter some parsley and finish off with a drizzle of the garlic-tahini-yoghurt dressing. 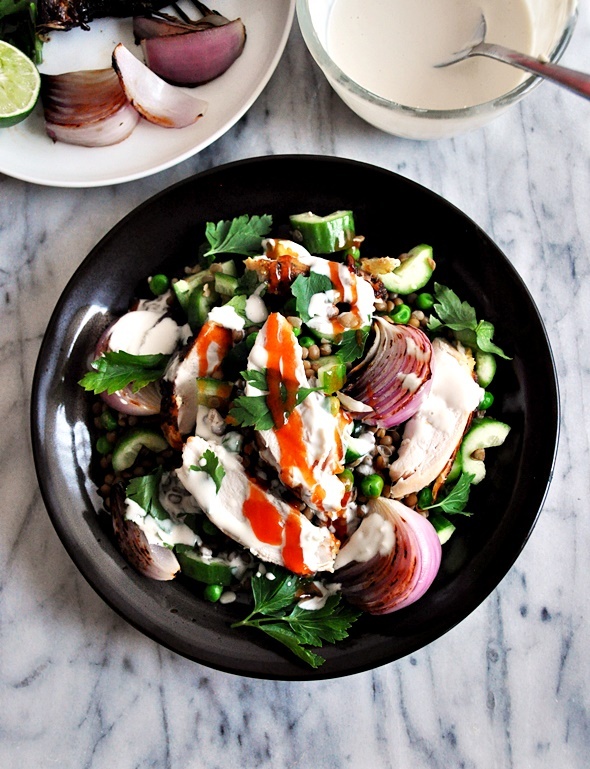 If you like a bit of spice, a light drizzle of Sriracha works very well with this salad too! 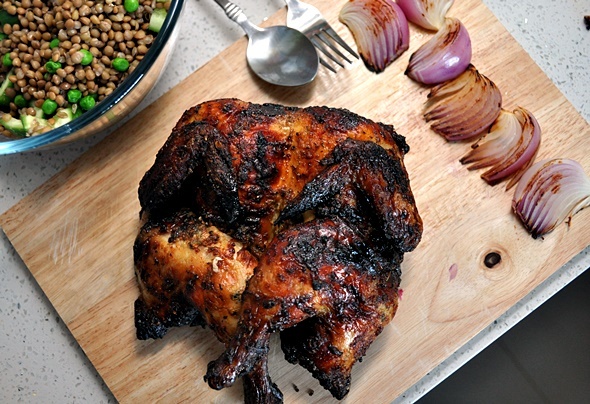 Do you make roast chicken salad at home? I’d love to hear what’s your go-to ingredients conbination? Oh I’ve been obsessed with making garlic yoghurt for grilled meats lately but hadn’t thought to add tahini too! Great idea for salad.